Cthulhu Tales is exactly what fans of the Old Ones can expect from a comic dedicated to the Lovecraft mythos. It’s dark, creepy, a little funny, and it offers only glimpses into the eldritch horrors. 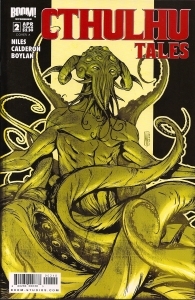 Cthulhu Tales 2 is told in three storylines, each written and drawn by different creators. “The Hiding Place,” by Steve Niles and Shane Oakly is the dark “reveal” story, culminating years of detective work, trying to prove that the mysterious Solomon King had, in fact, been a serial killer. The art is stark, almost noir, and is inked in black and white with only a yellow wash for highlighting, giving it that a very retro feel. “Katrina,” written by Eric Calderon and drawn by Jon Schnepp, is a short bit with a post-Katrina cleanup crew of prison labor. One of the laborers finds a hand-written journal from the storm and reads it. As all lovers of Cthulhu tales know, one should never read mysterious hand-written journals. Ever. The issue ends with “How to Get Ahead in the Occult,” by Christine Boylan, art by Chee. Here we have a wonderful college dorm room situation with a budding witch and her poetry-major roommate. This sweet coming of age story has it all– drunken frat parties, angst over growing up, jealousy, and of course Elder Gods from the Deep. I can’t say unequivocally that I’ll pick up issue 1 or any future issues. I like the Cthulhu stories, but I can only take so many of them before my brain starts leaking out of my ears (and I start locking all the doors and windows in a futile attempt at escaping the horror…. oh, the horror! ahem). And one thing that always bugs me about Cthulhu: you don’t get the continuity of characters to bond with (unless you find protagonist sympathy with scaly monsters bent on eating the world). But I will say this was a great example of “hit ’em hard, hit ’em fast.” Each short story is about 8 pages long, so they get to the point, hit you with the punch, and get out of there like a band of mugging swamp things. This entry was posted by Stephanie	on Saturday, July 19th, 2008 at 9:10 pm and is filed under issues. You can follow any responses to this entry through the RSS 2.0 feed. You can skip to the end and leave a response. Pinging is currently not allowed.